I've always said that I'll consider myself "old" when I start lusting after a Cadillac. Damn. I just became old. The stock 2004 Cadillac CTS-V is a pretty impressive car. It's got a 400 HP, 5.7 liter V8. The transmission is a 6 speed manual. It gets to 60 MPH in 4.7 seconds. That puts it in the same league as the Mercedes-Benz E55 and BMW M5... This is no Sedan DeVille. While the stock CTS-V is impressive, the Mallett CTS-V is amazing, bordering on insane (in a positive way). 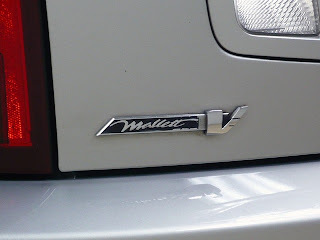 Mallett is one of America's premier tuners. To create the Mallett CTS-V, they threw out the 5.7 liter engine and dropped in a 7.1-liter V-8 block (of Le Mans Corvette fame), a billet crank, and forged pistons from GM Motorsports. The heads are from a Corvette LS6. The engine is force-fed by a Vortech supercharger with a Garrett/Vortech intercooler blowing at “about 16 to 17 psi,”. Mallet says this setup puts out 751 HP. Yikes. To handle all this power, Mallet includes double-adjustable coil-over shocks, bigger anti-roll bars and 18" wheels with Michelin Pilot Sport PS2 tires. The brakes are upgraded, too. I couldn't find any 0 - 60 stats for this car, but when Car & Driver tested one they did the 1/4 mile in 12.4 seconds at 125 MPH. With the stock CTS-V doing the 1/4 mile in 13.48 seconds at 105, you would have to figure that the 0 - 60 time is somewhere around or south of 4 seconds. This is not the usual type of car I write about. 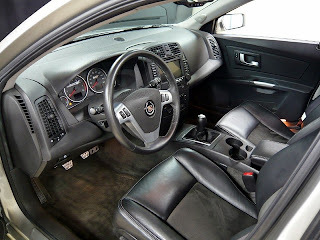 It's relatively new, relatively expensive ($56,000.00), and it's a Cadillac. But, in some weird patriotic way, it's pretty cool to sit here looking at this American made car and lusting after it. That hasn't happened much in my life, but maybe this is a start of something new. 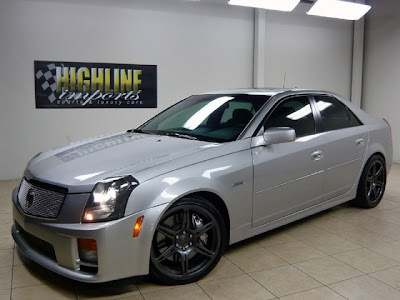 Located at a dealer in Hampton, NJ, click here to see the listing for this 2004 Cadillac Mallett CTS-V.
You can find the Mallett website here. 09/02/09 Update: The owner of this car saw the blog sent this e-mail to Jeff, who passed it on to me... "For the sake of clarification, the engine doesn't have a supercharger, it's normally aspirated and 7.0 liters. Also, (it has) stock 4 piston Brembos (which are excellent)." I appreciate the update. It's still a great car! It may be a great car, but it's ugly. The U.S. has a long way to go in the styling department. While I agree this car is no oil painting, I'd argue that nothing really is in the super saloon category. The caddy, externally, looks just a good as a M5 or even an RS6. The interior however does get a thumbs down, although I do believe they improved that on the latest version. If you had the money, this could be one hell of a deal. If the stats are correct and this thing is indeed pushing 750 horses, that puts it in Brabus / G-Power tuning territory, these rides (albeit new) would set you back $500k/$350k respectively. At $56k its probably the price of a couple of major services on your Brabus motor.